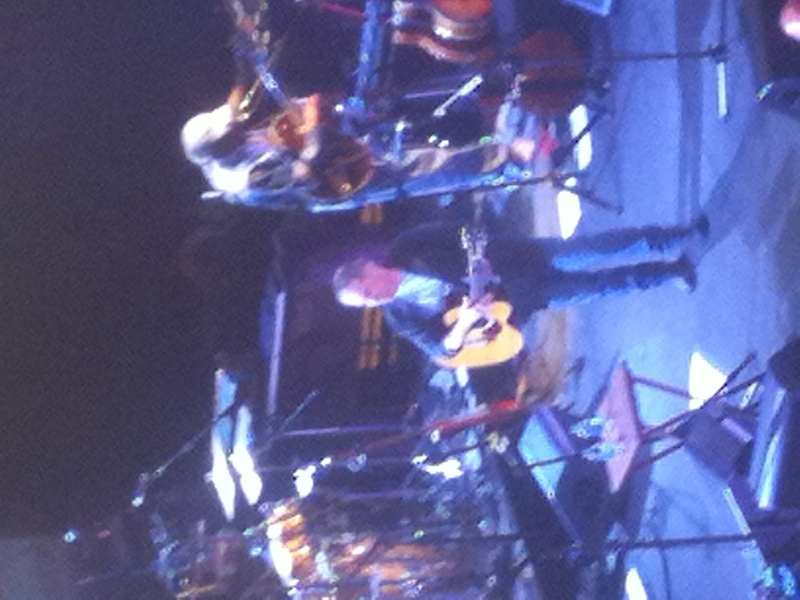 Paul Simon at the Ryman. Photo by Heather. — We got there a little late, unfortunately, so don’t know what he opened with. The first song we heard was “Dazzling Blue,” followed by “50 Ways to Leave Your Lover.” He then stopped to do his welcoming comments, including a nice remark that there are few concert halls that make you feel humble just to be playing there, but that the Ryman was definitely one of them. — After that, “So Beautiful or So What,” which is probably my favorite song from the new album. He had an eight-or-so piece band with him, and it was amazing how lush the arrangements were. But we’ll get back to that later. — “Slip Sliding Away” reminded me of the Simon & Garfunkel performance I went to last year. During that concert, which was, logically, mainly Simon & Garfunkel songs, I wondered what it was like for him to get up and do a show like that. The songs they were doing were things that he had written forty to fifty years earlier, and he’s done a whole lot since then. Does he have the same affection for the older material? Would he rather be doing newer stuff? That’s something you read about artists having to deal with — writing a song early on that becomes a hit, and so they have to play it years later to make people happy when they have sort of moved on from it and are getting tired of it. Point being, that did not seem to be the case at all at this show. Paul seemed to genuinely love and enjoying playing these songs, be it his older classics or the ones from his newest album. And that was neat to see. 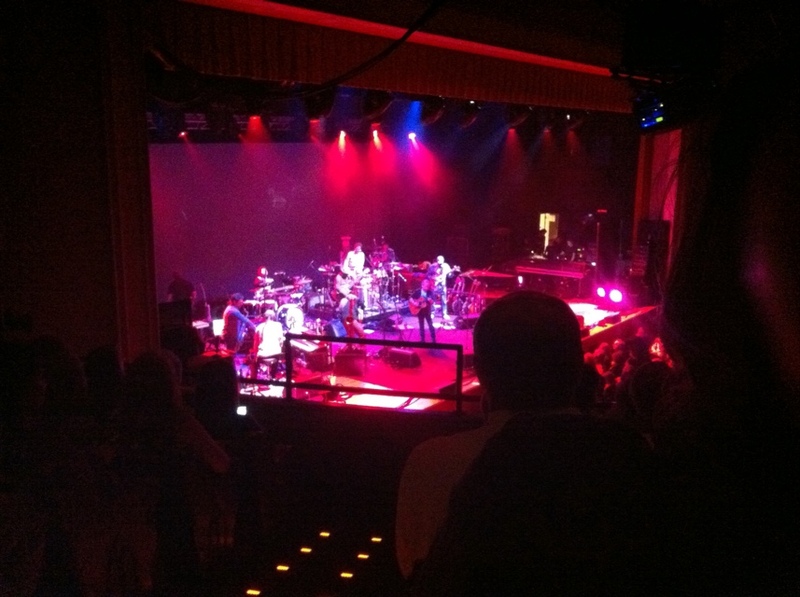 — Next up was an unreleased song about Viet Nam, which drove home that we were some of the younger people at the Ryman, albeit not the youngest by far. It says something, though, about the strength of a songwriter when you hope that they’ll play some of the songs that weren’t “good enough” to make an album. — I’m not sure why, but “Mother and Child Reunion” gave me a bit of perspective on the timeline of his career — the first concert in Central Park was in 1981, he did another a decade later in 1991, and now I’m watching him in concert two more decades later in 2011. I was a bit young to remember the first one, but remember being excited watching the second one. — There was a similar moment during “That Was Your Mother.” I remember driving to see a good friend in Lake Charles, Louisiana 15 years ago and making a special stop just so I could stand “on a corner in Lafayette, state of Louisiana” like in the song that I’d loved for years already at that point. The song took on a different significance when I dated a woman from there for a while. And now, with Heather, having kids in my life for the first time, there are slightly different resonances — “You are the burden of my generation; I sure do love you, but let’s get that straight.” Never the same river twice. I’d wondered if I should enjoy the song the same way after the ex connection, but, you know, hearing it there, it’s just too fun to not. — Also, one of the fringe benefits of being a successful musician, to me, would have to be that you get a free pass on your dancing being cool. You ever been to a concert and see a singer dancing in a way that, if they were just some man or woman in a club, you’d laugh at them, but because it’s their concert, they get to be cool? Totally apropos of nothing, I assure you. — During “Hearts and Bones,” I made a note about the versatility of the band. Often you might have a horn player who plays different horns, or whatever — different instruments, but in the same family. It makes sense given the diversity of the instrumentals in his songs, but the band he had with him was crazy versatile — almost all of them at different points playing instruments that had nothing to do with each other. It was pretty impressive when you paid attention to it. — Um, up next was a cover that I’m embarrassed to say I didn’t recognize. It had almost a Johnny Cash sort of country feel to it. After that was “Rewrite,” and then another song I didn’t know, and then “The Obvious Child,” which for me was the only point during the concert that I felt could have been better. I love the song and so probably had a very high standard, but the arrangement they did that night just seemed a little fast, lacking the range of the texture of the original. It’s a very high energy, driving, generally up-tempo song, but with moments that border on brooding, and those moments seemed to get lost in the energy of the live performance. Still awesome, though. — And then, “Diamonds On The Soles Of Her Shoes.” I was more than a little impressed, at the opening, that he and the band he had nailed the depth of the vocals. It was funny to see, though, that even his improv is scripted — they deviated from the studio version of the song, but very closely followed the almost-as-old Concert In Central Park live version, with the stretched out “tananananananana” riff. — During “Gumboots,” a guy was drumming the strings inside a baby grand piano like a xylophone. ‘Cause they were just that awesome. This was the last song before the first encore, which you knew was coming, because there was no way a Paul Simon concert would end with “Gumboots.” Nothing wrong with it; it’s a good song, but just not a show-closer. — That said, I assumed the first song of the encore really would be the end — Paul Simon, alone with his guitar, singing “Sounds of Silence” on a barely-lit stage. Powerful. — The next song could have ended it, too — “Kodachrome.” Its status as a classic was reinforced for me that night when I realized I was listening to Paul Simon sing Kodachrome in an era in which they really have taken his Kodachrome away — the song has outlasted its inspiration. — The show concluded for real with an awesome performance of “The Boy In The Bubble,” which made me happy with a cool space video playing in the background. Not that it wouldn’t have made me happy otherwise; it’s another favorite. I love how it still rings true years later — twenty years after it was written, it still makes lasers in the jungle sound like miracle and wonder. So baby don’t cry don’t cry don’t cry. OK, this post serves basically two purposes. One is that after posting the video for the first single for the album, I’ve already started getting some search traffic with people looking for information about it. That said, it was a sad statement of my fandom when I had to learn about the new CD on Facebook when my friend and former coworker Maggie posted the video. 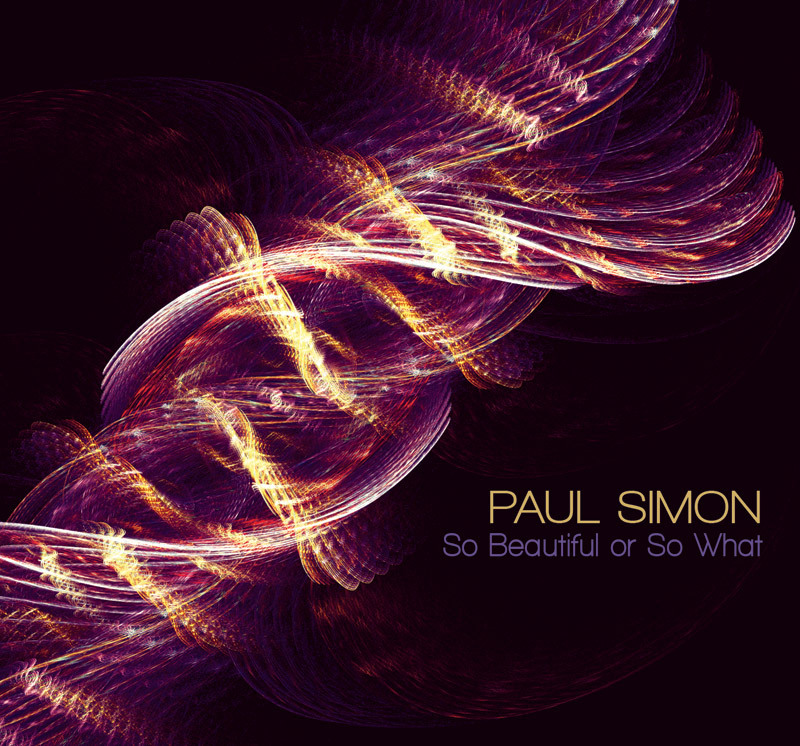 If you haven’t seen the video, I posted it a while back, and, while the single is available on iTunes, you can download it for free on the official Paul Simon site. PaulSimonWeb has an extensive article about the album, with some interesting information. Going through the links above, the officially released first single is the only one that’s in a form that reflects the final product, so I’ll be very eager to hear what the actual album sounds like. Years ago, science fiction grandmaster Arthur C. Clarke wrote a book, a sequel, titled “2010.” It was about the future. The future is now past. It’s a new day. A new year. A new future. Not the one that the book, or other futurists envisioned. But an amazing one nonetheless. As Paul Simon wrote of a different past future, “these are the days of miracle and wonder.”We live in an amazing age, of amazing possibility. Make resolutions if you want. Don’t if you don’t. The truth is, a good year is the one that isn’t defined by the things you wanted at its beginning, but the one that is defined by things you never would have thought to dream, by the hidden treasure. Go. Find yours.